Factions of all types can issue warrants for arrest and for execution against their own members, this is known as In Faction Arrest and Execute (IF A/E). Government, Mercenary, Bounty Hunter, and Pirate factions can implicitly arrest and execute within their own territory. Freelancers cannot arrest or execute. Someone wishing to do so must have the proper privileges within the faction for which they are arresting. Members of a faction can not issue an arrest warrant against their own leader, and cannot attempt to arrest their leader while they are in the same faction. It is possible to arrest both player characters (PCs) and non-player characters (NPCs). As NPCs do not have a unique handle, arrest warrants can only be issued for them on sight. Government-type factions may arrest and execute everyone within their territory. "Government Territory" is defined as any planet, system, sector that they control, and any super capital ship, capital ship, frigate, corvette, or space station that they own. Regular factions may authorize Government, Mercenary, and Bounty Hunter factions to issue warrants, arrest and execute within the faction's territory. "Faction Territory" is defined as any planet, system, or sector that they control, and any capital ship or space station that they own. Deep space and uncontrolled sectors are considered territory for all government, mercenary, bounty hunter, and pirate factions. Uncontrolled systems are considered territory for the faction that controls the sector. Uncontrolled planets are considered territory for the faction that controls the enclosing system. Faction owned super capital ships, capital ships, frigates, or corvettes that are in hyperspace are considered territory for the faction that owns them. Arrest is not possible aboard all other ships during hyperspace travel. Ships, vehicles, and other entities that are docked aboard a faction owned super capital ship, capital ship, frigate, corvette, or station are considered the territory of the faction. Planetary control extends to the square in orbit above a planet. Acme Inc, an items production faction, controls the planet Tatooine. Acme Inc cannot arrest on the planet; however, they can authorize the mercenary faction Hammer Slammers to arrest on their behalf. Any arrest warrants issued by Hammer Slammers can now be executed from within Acme Inc territory. Acme Inc controls a system which contains an uncontrolled planet. For the purposes of arrest and execute, this uncontrolled planet is considered territory of Acme Inc. Any authorized Government, Mercenary, or Bounty Hunter factions can arrest and execute on the planet on their behalf. Joe Bloggs owns a Trading II Station located within an Acme Inc controlled system. Since Joe is not a faction, the station is considered territory of the system government, in this case Acme Inc. Any ships or vehicles docked within the space station are also considered Acme Inc territory. Joe Bloggs is a member of the Galactic Empire and flies his personally owned Bayonet-class Light Cruiser into a New Republic controlled system. A New Republic member gets access to Joe's ship and is able to arrest him. A Hammer Slammers owned Corvette CR-90 ship docked within the Trading II Station. The ship is a faction owned capital ship, so it is considered territory of Hammer Slammers, irrespective of the territory of the Station it is docked within. This is the only exception to the above rule. Joe Bloggs flies a personally owned YT-1300 class freighter in hyperspace. While it is in hyperspace, no arrests can be made as it is not a faction ship and there is no direct territory control available. Joe Bloggs flies a Acme Inc owned Corvette CR-90 capital ship in hyperspace. While it is in hyperspace, arrests can be made by any Acme Inc authorized Government, Mercenary, or Bounty Hunter factions. In order to arrest a player character (PC), you must be equipped with stun cuffs in your hand(s). If the arrest is successful the stun cuffs will be equipped to the target. Upon release the stun cuffs will fall to the ground. Same room, if the target is in a room. Same surface coordinates, if the target is on the surface of a planet but not in a room. If a faction is dissolved, all prisoners will be released and all warrants will be deleted. Success or failure of an arrest will be calculated immediately when the arrest attempt is performed. After an unsuccessful attempt to arrest a character, the target is protected against any other arrest attempts for 24 hours. Any character can choose a general default reaction, and can also set a reaction to internal faction arrest and for every potential faction that may arrest him. This can be set on your Faction page in the Darkness interface (even if you are freelance). I can define for my character that he will not resist any arrest attempt by his own faction, and will usually try to run away in case of any other faction, except for the Galactic Empire, in which case he will fight. If no default behaviour is set by the player the automatic default will be hiding. The primary skill is counted with the full skill level, the secondary with half the skill level. A random factor will further modify the outcome. This is necessary to determine the outcome when arrester and target have identical skill levels, and because there will never be a 100% probability of success. Even the most skilled character around can have a bad day and be taken off guard. The random modifier for arrests has been modelled in such a way that small fluctuations happen all the time, helping to determine the outcome when skill levels are identical. Large fluctuations will be rare, but it is possible, although extremely unlikely, that a character with level 5 skill will fail to arrest a skill level 0 character. After any attempt to arrest a character or NPC, or after a character or NPC has been released, the character or NPC will be immune to arrest attempts for 24 hours. This arrest protection does not apply to NPCs of your own faction so that it can not be abused to protect them against arrest by another faction. Move freely. This includes leaving the room, position, or party he is in, or piloting a ship or vehicle. Administrate his personal or faction assets and his faction (regardless of whether he is the owner, leader, or a member with privileges). Leave or join a faction. Any player character can force an arrested character into their party, regardless of if they were the arrester. Darkness messages can still be sent to arrested characters since they are used for out of character purposes as well. A PC or NPC can be released from arrest by a member of the arresting faction who has issue arrest privileges. A PC or NPC can also be broken out of arrest by another character at the same location who has an Electronic Lock Breaker item equipped. A character has the option to turn his character into an NPC and recreate as a new character at any point they wish. The NPC will have the same handle and race as the character had and any assets will follow the same rules as when a character is killed. If you drop your character, and regret doing so later, the decision shall not be reversed. In order to execute a player character (PC), there must be a death warrant issued for the player character by your faction. The executor must have the enforce death warrant privilege or the executor has issue death warrant privilege in order to proceed with the execution. The player character must be arrested in order for execution to be an option. The Execution options can be found in the Faction Arrest and Execute option area, the same page on which warrants are displayed. At the same surface coordinates, if the target is on the surface of a planet but not in a room. The target must also be a member of your party. Issuing a warrant for someone's death is an act that will set you down a dark path, and should not be taken lightly. If the target has a Force Meter of 20 or greater, you gain -2 to your Force Meter. If you have a Force Meter of less than -10, you will suffer no further effects. 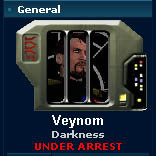 Arresting someone is the job of security personnel the galaxy over. It will only affect your Force Meter in extreme cases. If the target has a Force Meter of 40 or greater, you gain -3 to your Force Meter. If the target has a Force Meter of -40 or less, you gain +3 to your Force Meter. If the target has a Force Meter of 40 or greater, you gain -1 to your Force Meter. If the target has a Force Meter of -40 or less, you gain +1 to your Force Meter. If the target has a Force Meter of -40 or less, you gain -3 to your Force Meter. If the target's Force Meter is not in these ranges, there is no effect. If the target has a Force Meter of -10 or greater, you gain -5 to your Force Meter. If the target has a Force Meter between -10 and -30, you gain -3 to your Force Meter. If the target has a Force Meter of -30 or less, you gain +5 to your Force Meter. If the target has a Force Meter of -10 or greater, you gain -3 to your Force Meter. If the target has a Force Meter of -30 or less, you gain +3 to your Force Meter. If the target has a Force Meter of -10 or greater, you gain -2 to your Force Meter. If the target has a Force Meter of -30 or less, you gain -2 to your Force Meter. If the target has a Force Meter of -30 or less, you gain -5 to your Force Meter. Executing without a death warrant is murder. If the target has a Force Meter of 40 or greater, you gain -50 to your Force Meter. If the target has a Force Meter less than 40 but no less than -40, you gain -30 to your Force Meter.